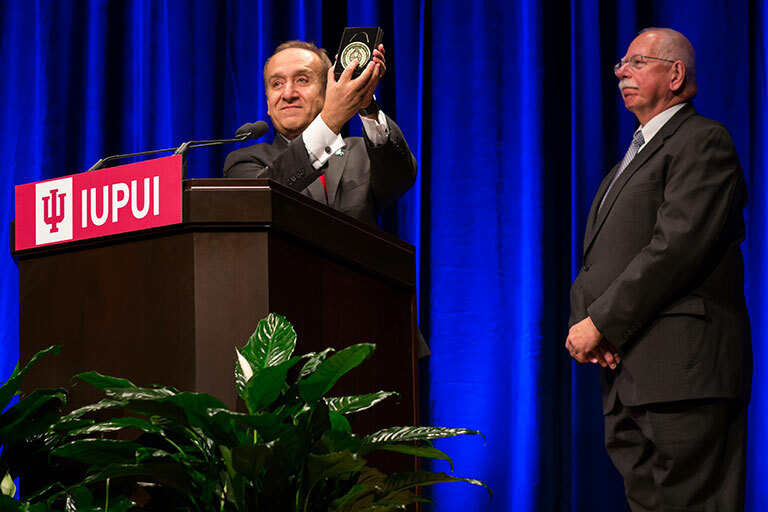 On November 7, 2017, Bill Plater was awarded the IUPUI Chancellor's Medallion by Chancellor Nasser H. Paydar during the chancellor's 2017 State of the Campus address. Dr. Plater was recognized for the pivotal role he played in laying the foundations of the Indianapolis campus. Dr. Plater is a Chancellor's Professor emeritus of public affairs, philanthropy and English and executive vice chancellor and dean of the faculties emeritus. During his time at IUPUI, Dr. Plater led the development of IUPUI's first comprehensive campuswide strategic plan; spearheaded the establishment of University College as the entry point for IUPUI beginning students; presided over the establishment of the Center on Philanthropy, which has grown into the world's first school of philanthropy; and embraced the power of technology, establishing what was then called the School of Informatics at IUPUI. These, as well as numerous other efforts, were components of his vision for IUPUI to become a leading urban research university. In 2006, the American Association of State Colleges and Universities established the William M. Plater Award for Leadership in Civic Engagement, the first national award of any kind to recognize chief academic officers for their leadership in higher education. Dr. Plater was the first recipient of that award. IUPUI honored Dr. Plater in 2006, establishing the Plater Medallion for Civic Engagement, which is awarded to students graduating from IUPUI who have outstanding records of civic engagement. IUPUI also established the Plater International Scholars Program, providing a four-year tuition scholarship, residency in International House and a study abroad opportunity for a cohort of entering undergraduates.